JVC launches JVC VIDEOCLOUD streaming platform. London, September 2016: [Source: JVC] JVC introduced JVC VIDEOCLOUD, an online video and live streaming platform at this year’s IBC show. Ideal for small businesses and creative individuals, it offers a simple, powerful content management system for live video or VoD, skinnable players, website builder tools and rich performance analysis tools. JVC VIDEOCLOUD enables you to stream live from JVC’s range of streaming camcorders, along with encoders from other manufacturers, and you can also stream directly from Streamstar’s range of multi-camera production tools. JVC VIDEOCLOUD lets you broadcast live events from anywhere in the world and use cloud-based transcoding to provide the best user experience possible. JVC VIDEOCLOUD also manages your video library by enabling categorizing, metadata adding and managing access rights, all from a computer or smart phone. There are a range of monetising options built in too, enabling customisation of your users’ viewing experience, with tools to help users configure their own website, add banners or video advertising. One clever function of the JVC VIDEOCLOUD platform is the ability to learn about its audience. Users receive detailed insight into their viewers’ behaviour, including metrics like ATS, regional split, devices and many others. It’s also possible to connect the system to a Google Analytics account for further analysis. To provide an exceptionally smooth user experience on any device and any network, JVC VIDEOCLOUD runs on Akamai’s CDN, which serves more than a third of the global video traffic. The JVC VIDEOCLOUD system is already in use with the Slovakian Foreign Ministry (http://www.mzv.sk/web/en), who recently used it to record and produce a live 1080p stream of the Slovak Presidency of the Council of the European Union. This stream of the press conference was sent to JVC VIDEOCLOUD, and the user then had the choice of watching it at five different qualities. JVC VIDEOCLOUD is also used by the Foreign Ministry to archive streams and store additional videos, which are published on the official page via embed codes that have been generated in JVC VIDEOCLOUD’s backend. To see some examples, please visit www.eu2016.sk/en/videos. With the launch of JVC VIDEOCLOUD, JVC now provides everything you need to manage your content, from acquisition through to transmission. 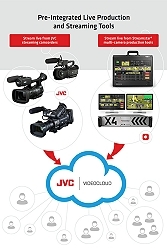 JVC will be taking JVC VIDEOCLOUD out on its Go Live! tour over the next year, kindly supported by external companies, Tividoo and Sennheiser. Tividoo (www.tividoo.com) supplied the Dawson satellite and connectivity, while Sennheiser (www.sennheiser.com) supported the tour with wireless microphones. If you would be interested in seeing this, or perhaps arranging an event where you’d like the system to be centre stage for your own customers, please email jvcvideocloud@nl.jvckenwood.com. For further information on JVC VIDEOCLOUD, please visit www.jvcvideocloud.com.